Whether you like it or not, society is changing. Quickly. Recent actions by the Obama administration place schools and parents in a difficult position. In an effort to protect transgendered kids, federal funding will now be tied to allowing them to use the restroom and locker room that corresponds to their gender identity. Add to that the ongoing American Family Association boycott of Target stores over their transgender bathroom policy. It’s gloriously simple, yet so easy to forget: We’re wretched sinners. We’re only saved because Jesus paid the penalty for our past, present and future sins. Transgendered people are in desperate need of forgiveness through Christ, just like us. Let’s exercise the humility that comes from the knowledge of sin, and embrace our primary responsibilities of loving God, loving our neighbors and making disciples. Don’t embarrass yourself, or the rest of us on social media. I get it. You’re scared, frustrated and angry. You can’t believe that the America you grew up in looks like this. You should definitely talk to someone about it. Call your best friend. Talk to your spouse. Head over to your small group leader’s house. But please, remember that social media is a public forum. If you love Jesus, be sure to exude love, joy, peace, patience, kindness, goodness, faithfulness, gentleness and self-control (See Galatians 5:22-23). Remember that Jesus said peacemakers are blessed. Paul admonished us to live at peace with everyone, as far as it depends on us. When people look at your Facebook posts, I hope they can see Jesus. Outrage is a futile response. In a recent blog post, author Stephen Altrogge raised some thought provoking ideas about Christians and outrage. Without a doubt, it feels good. It may even seem justified. But it’s both futile and unhelpful in situations like this. Why? People who don’t know God won’t listen to us (1 John 4:5-6). And outrage never leads to righteousness (James 1:20). So let’s get productive and move beyond outrage. Your child’s teacher didn’t do this. Neither did their principal, or the customer service representative at Target. If the food is terrible at a restaurant, it’s not the server’s fault. But lots of people yell at them anyway. Resist the temptation to call your kid’s school and holler at someone. They didn’t create this policy. In fact, they probably heard about it the same way you did. Don’t make life harder for them by sending angry emails, or leaving irate voicemails. Give them some space, and ask respectful questions. But don’t blame them for a situation they didn’t create. People at your local Target store just work there. They don’t create company bathroom policies. Leave them alone. If you want to voice your concerns, call or write the corporate office. If we’re lovers of truth, let’s not rely on our favorite pundits or commentators to interpret it for us. Let’s seek it ourselves (If you want to read the short letter for yourself, click here). Be like Paul: Get creative and exercise your rights. The Apostle Paul set a great example for us when he was oppressed. If you haven’t done so recently, take time to read through the book of Acts, chapters 22-28. Paul boldly claims and exercises his rights as a Roman citizen. 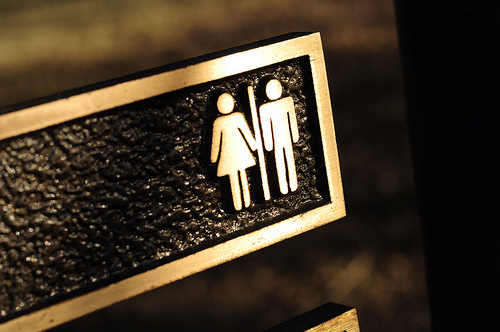 If you’re upset about the various new bathroom policies, you can do something about it. We have wide ranging freedoms including speech, assembly and press. Exercise them. As blogger and radio host Julie Roys recently pointed out, the Administration’s letter may not even be enforceable. But don’t just focus on what you don’t like. Let’s embrace our God given creativity, and work toward a viable alternative solution. Transgendered kids deserve protection and freedom in school, and all students have a right to privacy. What if Christians led the charge toward a viable solution that works for everyone? This is a tough pill for many to swallow. Particularly those who are passionate about politics. But the Bible is pretty clear. Solomon said, “Never make light of the king, even in your thoughts. And don’t make fun of the powerful, even in your own bedroom.” Romans 13 and 1 Peter 2 both remind us to honor and respect government authority. When called before the Jewish high council that wanted to kill him, Paul referred to them as “brothers.” He spoke to Governor Felix, Governor Festus and King Agrippa with gentleness and respect (See Acts 24 and 25). You don’t have to like what the government does. You don’t have to be quiet about it either. But there are ways to do so that reflect the character of Jesus and respect those He placed in positions of authority. I love using wildly exaggerated examples to prove a point. I probably do it too often. So let’s be guided by reasonable thinking and factual information. Bathrooms in schools and stores won’t instantly become violent places devoid of privacy. Boys and girls won’t be showering together tomorrow after gym class. In fact, students haven’t been showering at school for decades. Also, transgendered people likely represent about 0.3% of the U.S. population, so most kids won’t have to face this problem. It’s certainly an issue that needs to be addressed, and voices of concerned parents need to be heard. But there’s no need to panic. It’s still illegal to assault people in bathrooms. Gratefully, it’s been illegal to physically and sexually assault people in the United States for a really long time. Those laws aren’t voided in bathrooms and locker rooms. It’s also illegal to secretly take pictures of people when they’re changing or going to the bathroom. If something terrible were to take place, the perpetrators will be apprehended and punished. And they should be. Your kids can be wise…if you teach them. Adults often underestimate the intelligence of kids. If parents spend a few minutes talking to their kids about this, I’m sure we can give them ideas as to how to handle difficult situations. For example, kids sit out of gym class every day because they refuse to change clothes, or forget to bring them. Or, if they encounter an uncomfortable situation, they can walk away and get help. Lets empower them with wisdom and critical thinking, rather than scare them about something that may or may not happen. Most of us still have a choice. Free public education is a wonderful thing. Federal funding is also an incredible resource. But we always have a choice. We can choose to put our kids in private schools, or teach them at home. We can establish scholarship funds for those who cannot afford private school. We can find investors to launch new Christian schools across the country. While I don’t think Christians should abandon public schools, nobody is forcing us to attend them either. The world is watching us. Our ideas, words and actions will be attributed to Jesus because we are His ambassadors. This is both an enormous responsibility, and a wonderful opportunity. May God grant us the wisdom and patience to represent Him well, and guide the lost to salvation through Jesus. Great words of wisdom & encouragement I am a team member at Target and yes it’s a job even though I don’t agree with all of their policies I don’t think they ever should have come out with it because as liberal as they are everyone knows what their Viewpoint is. Thanks for reading and commenting, and for your kind words! Thank you very much for this enlightening information and different perspective on this issue; I am ashamed to say I was one of those Christians that was panicked. I was misinformed thus misguided in my views. And I forgot to love, even the unloveable. Now I can have an intelligent conversation on this issue. Wow- thanks so much! Praise God! I am a Christian, Mother of 3 and high school PE teacher/Coach… this has been a very real situation in our school. I have struggled with perspective as I have witnessed the discomfort as biological female students are presented with the challenge of sharing the locker room with a transgender young man. My heart is crushed for both sides. I sincerely do love all my students – we all want and need to be loved. But it is more complicated then simply authoring rights to the 0.3% that more largely infringe on the privacy of the 97% who do identify with their created gender. This new legislation is complicated for ALL involved – including the minority sought to protect. And so, I have wrestled with strong opinions inside my heart and I have grappled with anger over the uncomfortable nature of this new trend in America – trust me, there are many at the high school age that ‘entertain’ this life style of LGBT as more of an attention getting, risk taking experience and see it more of a ‘group’ to belong to for acceptance versus the ‘real sexual identity’ confusion/crisis that the 0.3% perhaps truly do struggle with. What are we encouraging as adults? And for that, I find it concerning that at the federal level we have come to make government decisions that encourage, draw attention to, sensationalize a life style that likely would not be attractive to a ‘lost’ and seeking population of teens searching for a group to belong to. It seems a solution for ALL can be created and implemented so that ALL are reasonably respected. This article has been helpful in that you have beautifully drawn from God’s word and helped me better reason with my frustrations, concerns, and desire to be fair and continue to love all. I am a Christian and I long to be a light to others and I am prayerful that I will respectfully and lovingly go about life as God would call me to do. Louise – Thank you for your personal story, and for your words. I’m grateful to know that my post was helpful for you. May God guide you as you live out your faith as a teacher. Blessings!